I devoured this book while on a vacation and it was hard to put down! I felt a connection to the characters and felt happy while reading it. Would recommend! I Owe You One is a charming, heartwarming read that takes us into the life of the thoughtful Fixie Farr as she struggles to keep her family’s home goods shop thriving while juggling an on-again/off-again relationship with her high school crush, two overbearing, older siblings, and a back-and-forth IOU with a handsome businessman. The prose is well turned and light. The characters, including all the supporting characters, are unique, amusing and reliable. And the plot is a smart, engaging tale full of quirky mishaps, tricky moments, awkward situations, delicious chemistry, romantic drama, self-reflection, and the intricacies of familial relationships. 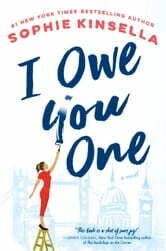 Overall, I Owe You One is another light, refreshing, entertaining read by Kinsella that's perfect for fans of insightful, witty, contemporary romance novels. I have been a fan of Sophie Kinsella’s since first reading the Shopaholic series, and I have remained one all through the years. She is in fact the only Women’s Fiction author constantly on my list, regardless of the book description. I know that I can depend on Ms. Kinsella for excellent writing, stellar dialogues, and stories that will keep me interested. I OWE YOU ONE is, simply put, a perfect character-driven novel: each one a complex entity, unlike any other in Ms. Kinsella’s books, and a story so compelling that I experienced a rollercoaster of emotions, from rage to tears and relief. I was nearly exhausted after the first chapter, but I already cared so much about our heroine, Fixie, that I nothing could have prevented me from reading this extraordinary book, which had me as excited as any great thriller. Many of us will identify with because we don’t always see what is in front of us when we love, don’t we? I can hardly find the right words to express how moved I was in so many different ways. What I can say is that I very, very highly recommend I OWE YOU ONE; it does not get any better than this. A delightful, fight for what you want romance! Fixie Farr is a fixer of all things, so when she feels responsible to keep the family business going, chaos ensues. This was a charming story by the amazing Sophie Kinsella, who write such wonderfully captivating and witty characters.